These deer were seen together near Charolais Road in Paso Robles jumping fences in and out of private property. As I was on my way home from the computer shop this afternoon, I avoided Spring Street Traffic by traveling on Oak Street. Even though the temperature was in the triple digits, I could not pass this row of street trees without stopping to photograph this magnolia tree, one of many I have seen downtown this month. 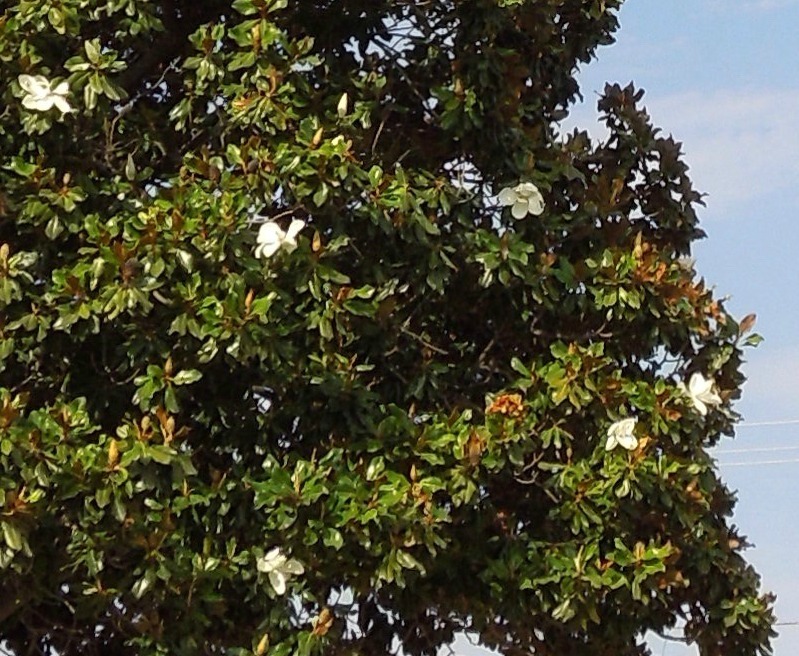 There are also magnolia trees in City Park. I love their huge white flowers. As you can see, the tree itself is pretty huge. Do you see how it towers over the houses? 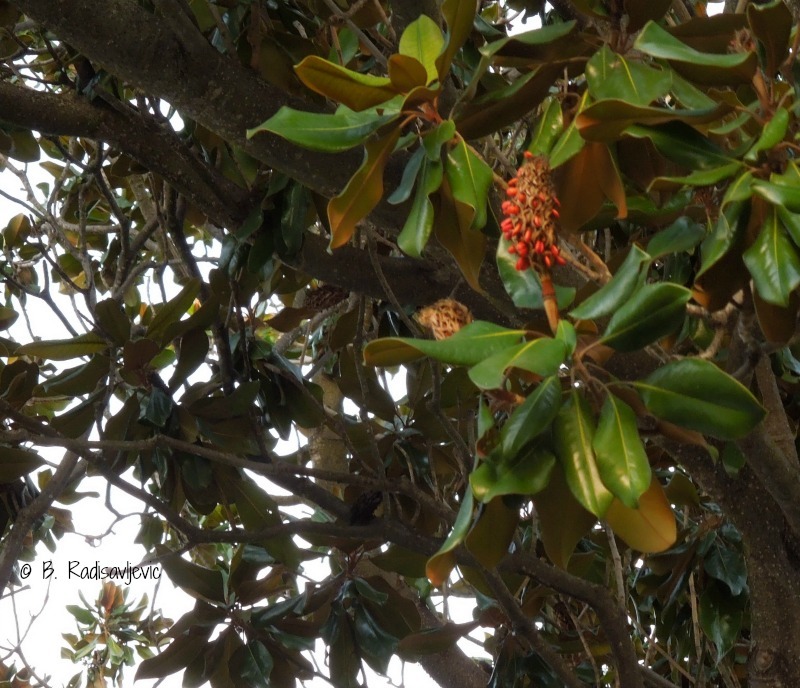 This next shot focuses in more on the magnolia flowers. Even after magnolia flowers loose their petals, they are still beautiful. They turn into these colorful cones of small fruits. Each fruit splits to reveal a red seed. Have You Considered a Magnolia Flower Theme for Your Wedding? Amazon has a lovely selection of matching paper products for your wedding. Zazzle has a beautiful magnolia postage stamp for sending your invitations, save the date, RSVP and thank you cards. Zazzle also has a selection of magnolia designs for the reception. See some of them below. If you click through you will probably find plates or napkins to match the ones below in links from the descriptions. The wedding favor bags or tins also have magnolia themes. Some of the products feature pink magnolias if you prefer pink. You can personalize all of these products. 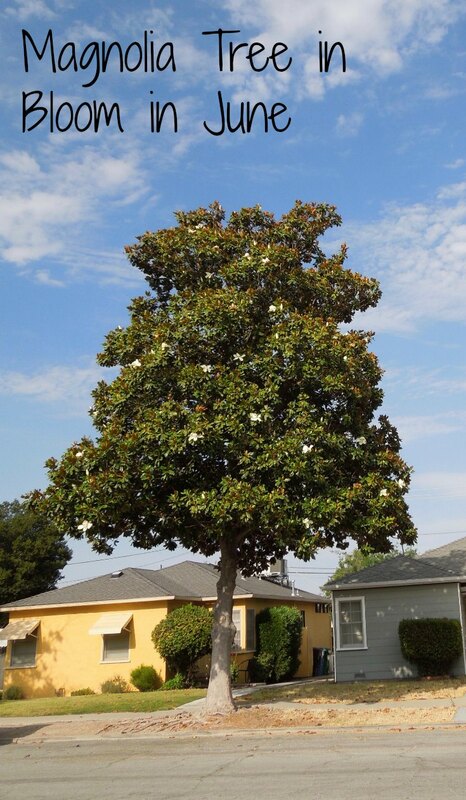 Whether you want to plan a magnolia theme wedding or just enjoy magnolia flowers you see in trees, enjoy your summer. When it's hot, I try to find an errand to do in San Luis Obsipo. Today I had a great excuse to go. I had to pick up my computer from the MacSuperstore. They were very good to me, as they always are. One of the tech people spent close to an hour with me, so I'd be sure the problems I'd been concerned about were solved. He also reinstalled all the programs that had been on the old hard drive that were not yet on the new one. As a finishing touch he installed a free malware program. Then he helped me pack up the computer and he carried it to the car. As soon as I got back into the car we headed across the highway to Costco to get gas and shop. From the parking lot we had clear views of the hills that surround Costco and the Target Center. 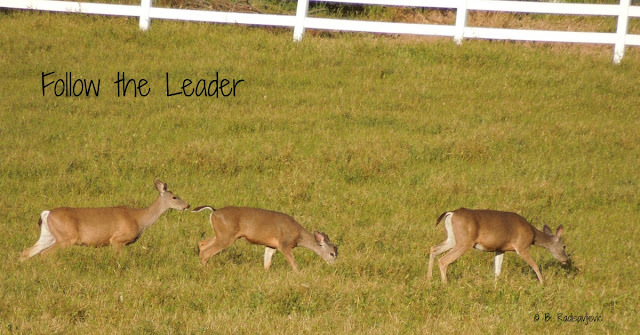 I snapped the photos while Hubby was getting out of the car. It was cool enough in San Luis Obispo today that people actually might have enjoyed hiking the trails in those Irish Hills. We didn't have time, and needed to finish our shopping and get home. Below you can see the hills south of the MacSuperstore and the Target Center. The hills look closer than they are. 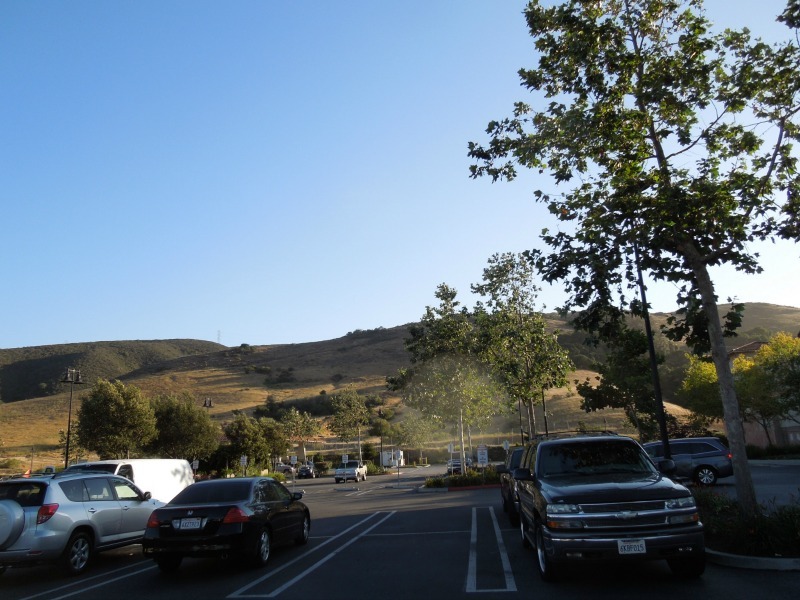 You have to walk about two blocks to get to Los Osos Valley Road, the main highway to Los Osos. Were you to cross it, you would be headed for more parking lots and businesses located in the Target Center. The hills really wrap around the city. 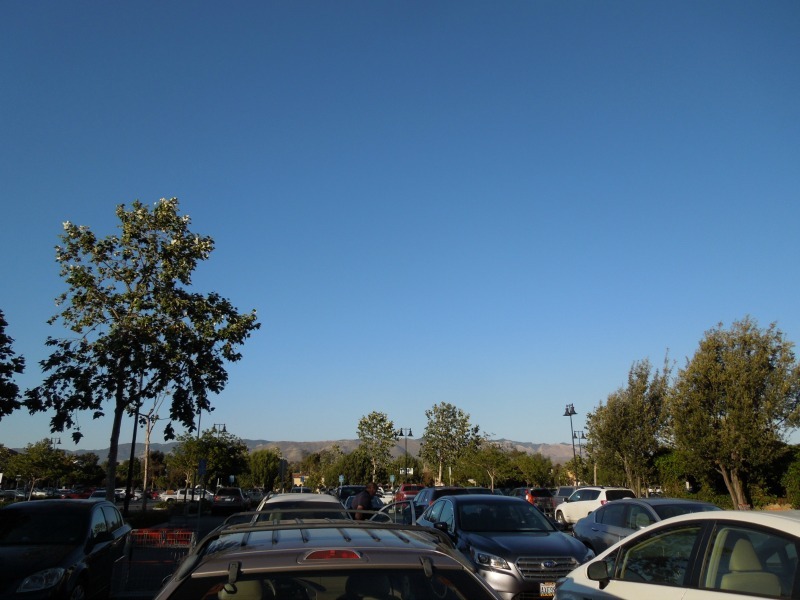 These photos were both taken from the Costco parking lot, but from different directions. One thing I love about San Luis Obispo County is that I can almost always see a mountain or a tall tree. I grew up in a flat place in Southern California. I never realized what I was missing when I was growing up, since I rarely left our small town. San Luis Obispo County has it all -- mountains, trees, and the ocean. This was a great day to be in San Luis Obispo. When we left Paso Robles this afternoon at five o'clock, it had been 105 degrees. When we got to San Luis Obispo, it was in the seventies. When we got home again at 8:30, it was in the high eighties. We were able to escape the heat and turn off the air conditioning at home at the hottest time in our house. When we got home, we could open the windows and get the inside temperature back down to the high seventies. I wish I had time to escape again tomorrow, but I'll be setting up my iMac and getting used to it again after using a PC almost exclusively for months. What terrain to you prefer to live in (or on)? Do you like your land mountainous or flat? What do you do to beat the heat? There was more than one election on June 7. 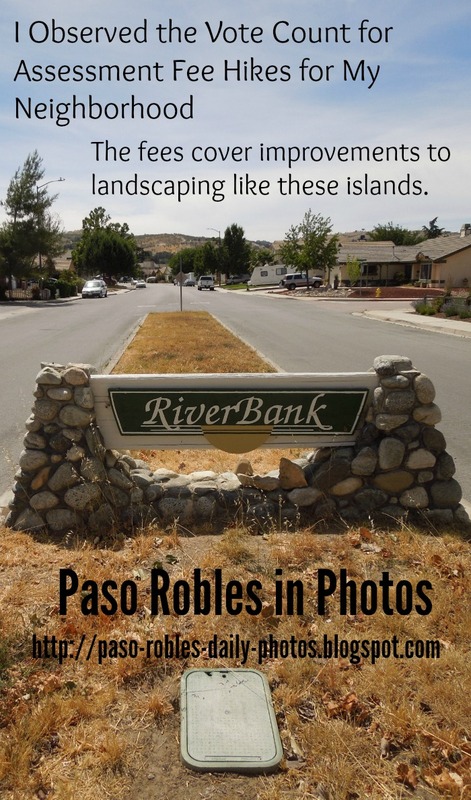 It was also the final day for Paso Robles neighborhood residents in District 1 to vote on whether their assessment fees would go up. 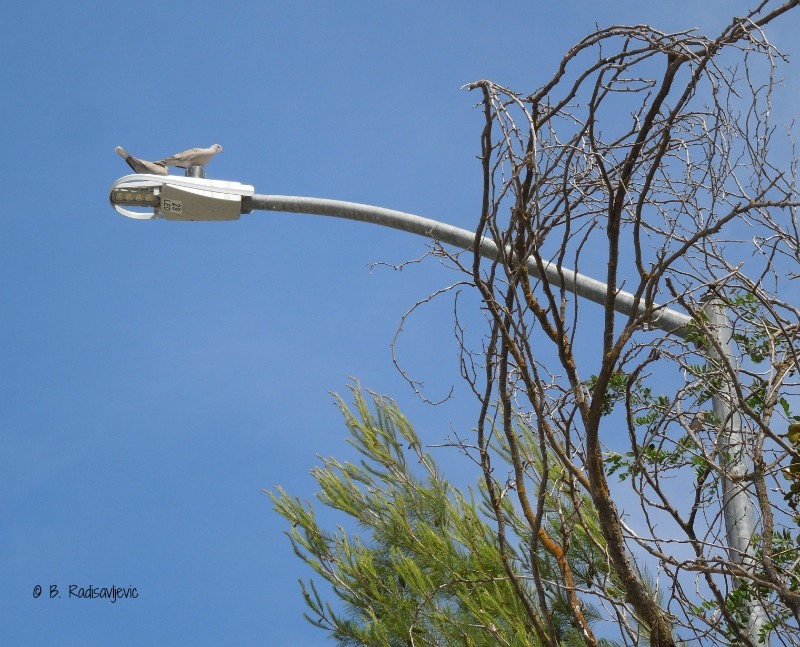 Landscape and Lighting Maintenance District 1 is divided into many zones and sub areas. All residents had to have their votes in to the city clerk by the end of the hearing at the June 7 City Council meeting. By law, a neighborhood's assessment can't be raised more than the maximum assessment rate already in place without a vote. 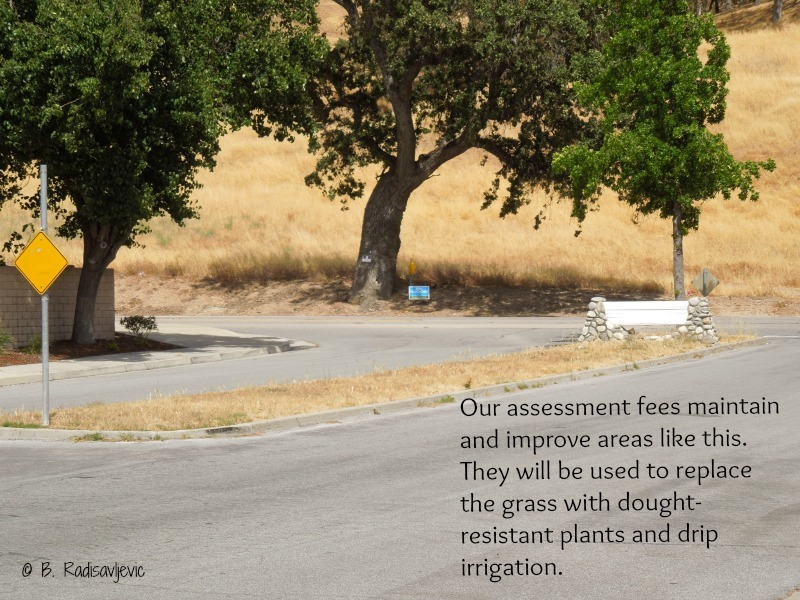 The assessment fee covers the expenses of maintaining the public landscaping and lighting for the neighborhood. If neighborhoods don't vote to raise their assessment fee, there will be no improvements in the street lighting, parkways, islands, slopes, and open space for these neighborhoods. 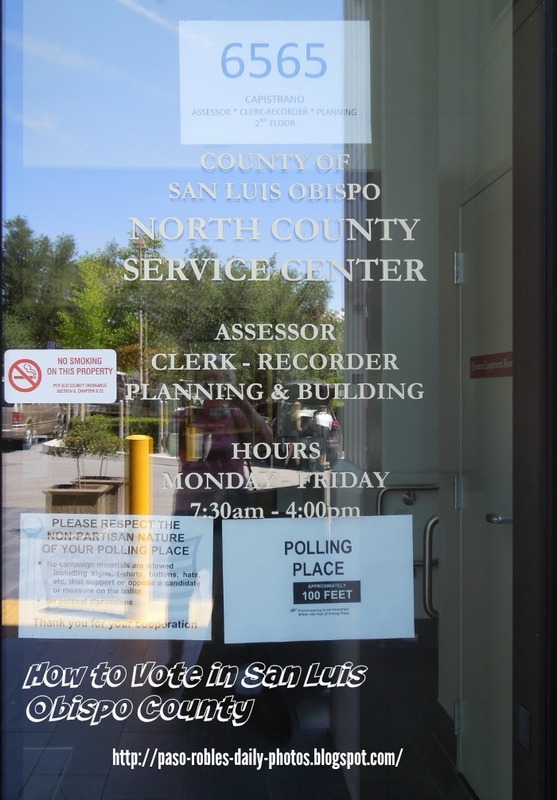 Even though most people mail in their ballots to the city clerk before the scheduled hearing, citizens still can still present written or oral testimony during the public hearing before the votes are counted. Then anyone who hasn't turned in their ballot is told it's time to get them in if they want their votes counted. As it turned out, no one from my neighborhood took the opportunity to speak. When the votes were about to be counted, those at the council meeting were invited to go outside the room and observe the vote count. I was the only one who did. When I left the city council meeting to watch the vote count, I wasn't sure what to expect. The two women in charge walked out with a box of about 500 ballots in sealed #10 envelopes. (You can see it on the far end of the table.) The most time consuming part of the process was opening all those envelopes -- especially since no one had thought to bring a letter opener. They did manage to borrow one from the library. As ballots were opened, they were separated into stacks. There was a stack for those with yes votes, one for no votes, one for ballots signed with no vote marked, and another for defaced ballots. Defaced ballots were those that had writing on them apart from the signatures and the mark for yes or no. The ladies were very reasonable in deciding what was defaced. A couple of ballots where the person had circled the choice before marking it were counted, since intent was clear. Ballots with notes written on them were declared defaced according to the rules, but ballots with attached sticky notes weren't. Never write on a ballot if you want your vote to be counted. 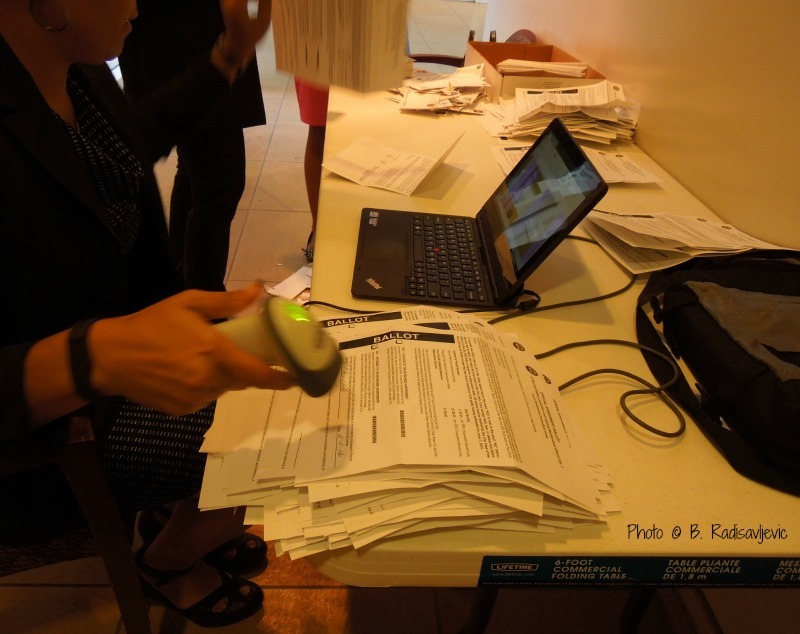 After enough ballots were open and stacked, the person at the near end of the table with the computer started counting them. You can see each ballot has two bar codes. That bar code identifies the parcel number and whether the vote is a yes or no. To avoid someone voting more than once, the computer will not record a second vote for the same parcel number. The stacks are scanned separately to make it easier not to scan the wrong code, but the woman was very careful and did double-check. Here's how that worked. The computer makes a sound when the vote is recorded. You might want to play this full size on YouTube when you finish reading here. At the end of the scanning, the computer had neatly tabulated the results by zone and sub area. The fee assessment passed in my Zone 4 Sub Area 5. Have you ever witnessed an official vote count? If so, how was it different than this one? If you learned something from this post, why not share it? Sharing buttons are below just above the comment box. This last photo was designed to share on Pinterest. 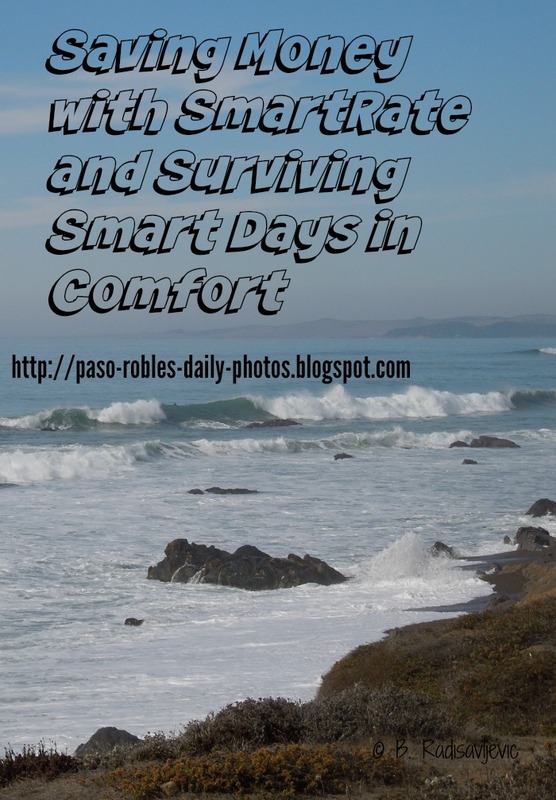 Last Friday I decided to do my errands in San Luis Obispo to stay cool on a Smart Day. I never really thought of Laguna Lake as a cool place until then. 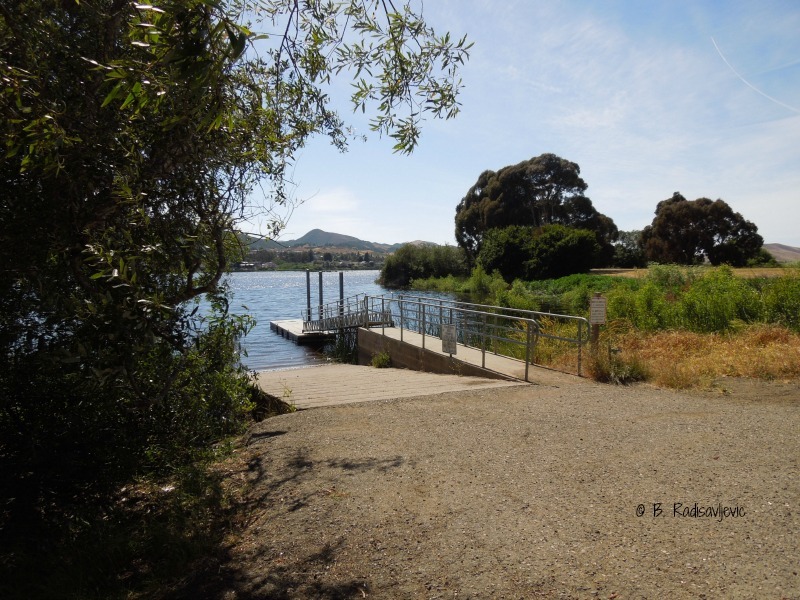 I can't think of any outdoor public place in Paso Robles, including the Lake at Barney Schwartz Park that would have been as cool that day . San Luis Obispo itself was 10-14 degrees cooler than Paso Robles was. 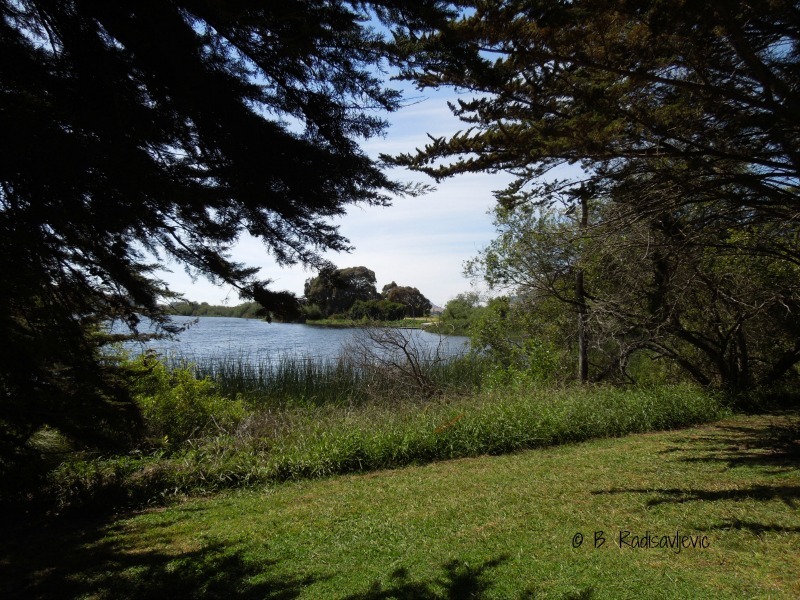 Laguna Lake is also a much larger body of water than the small pond-like lake at Barney Schwartz Park. What's so Cool about Laguna Lake? 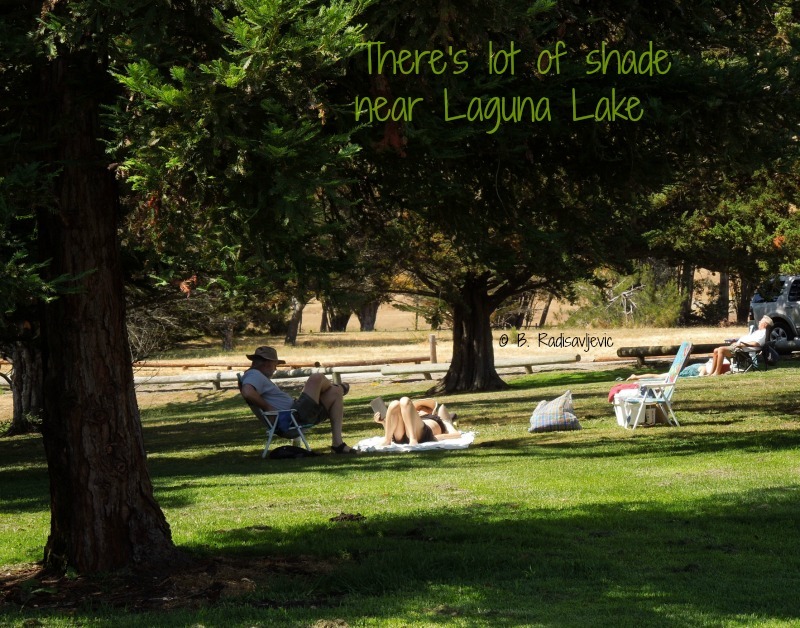 Laguna Lake has many shade trees scattered around the lake. I saw many people relaxing under them, napping or reading or just hanging out. The day I was there I did not see any boats in the lake or anyone fishing, but both forms of recreation are allowed. There is a barbecue area with picnic tables, but the one I saw by the lake was in the sun, not the shade. I had just stopped at the lake to take pictures, fully expecting the lake to be almost dry after this heat wave. I was wrong. I've never seen it so full. Last year at this time it was little more than a puddle. Now the water is actually lapping at the shoreline. I had not planned nor did I have time to stay for long on Friday. I was just suddenly aware that had I wanted to, I could have spent several hours there outside and remained relatively cool. If I had planned to stay for a longer period, I would have needed a cooler and a comfortable folding chair. It's important to have plenty to drink in hot weather, and those drinks are better cold. Now I can even get a rolling cooler that I can pull rather than carry. I would need the same for the beaches. The cheap chairs I've bought locally haven't lasted very well. I'm going to need new ones. At my age a blanket just doesn't cut it anymore. I'm amazed at how folding chairs have improved since I last bought one. I think it's time to invest in one or two of these items. The public entrance to Laguna Lake is at the intersection of Dalidio Street and Madonna Road. From the North County, take 101 to Madonna Road. When you exit, stay to the left. Turn left at the signal on Madonna. Get into the right lane. Diladio is the last signal before the commercial area on the left turns residential. The Post Office is on the left side of the street. You will turn right at that signal beside the park entrance. You can take a virtual view of the park as of December, 2008 here. You will notice how much greener it is in December than in the summer when the rain stops falling. Once you are in the park, you will follow Diladio to the first paved road and turn left . You will find a parking area, some of which is shaded by trees. This is close to the playground. There is also another large barbecue picnic area there. (See it in the virtual tour linked to above.) 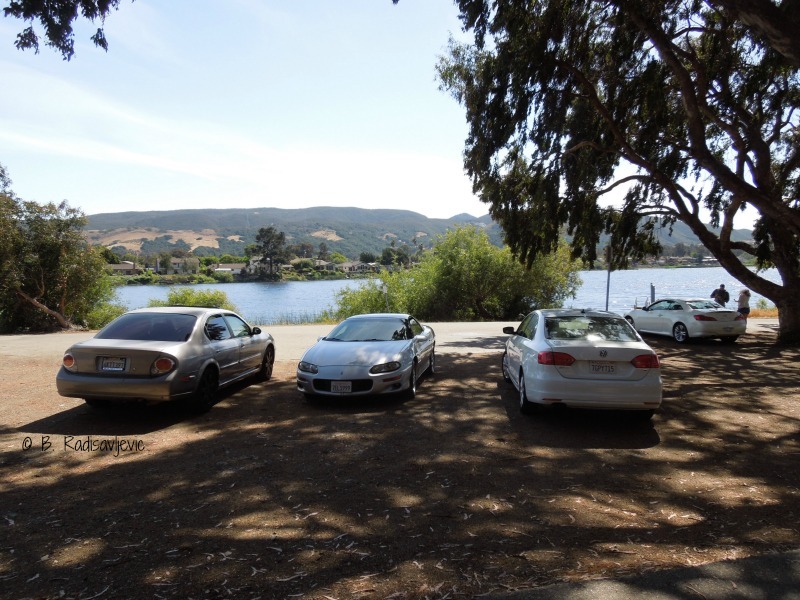 If you go to the end of the road and turn right, you will get to a shady parking lot near the boat ramp, pictured below. 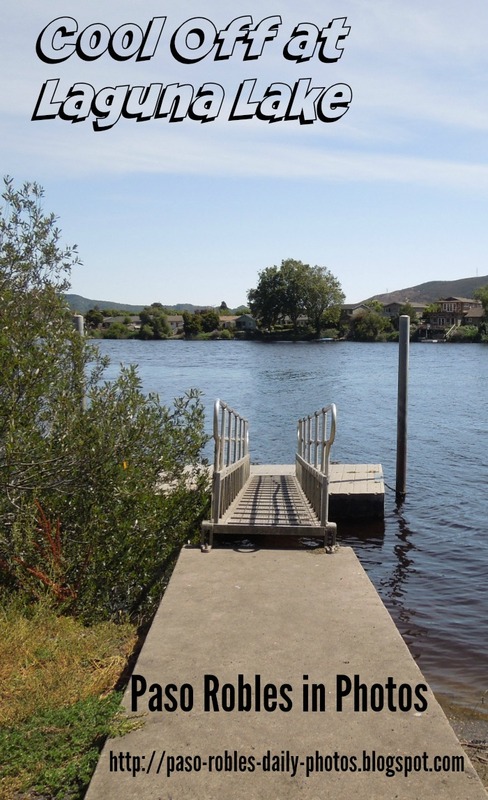 This is the boat ramp. You can see how high the water level is on it. You can compare it to July, 2015, and April 2016 in my previous post on Laguna Lake. There is a smaller ramp for docking here. Alas, my time at Laguna Lake on this trip was too short. So we will have just one last look. 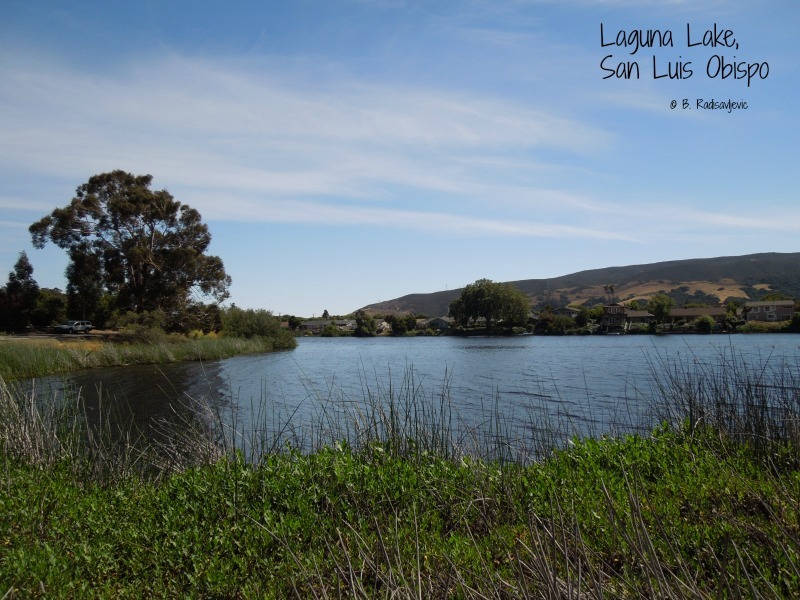 If it gets too hot in Paso Robles and you don't want to fight the traffic to get to the beach, remember that Laguna Lake is also a good place to beat the heat. Where is your favorite place to cool off when the weather gets hot? If you're not in my area, please use the comments to tell us where you're from and where you like to go when it's hot. When I was first married, we used to look forward to walking to our polling place for each election. Now that we are fifty years older, we are permanent absentee voters. 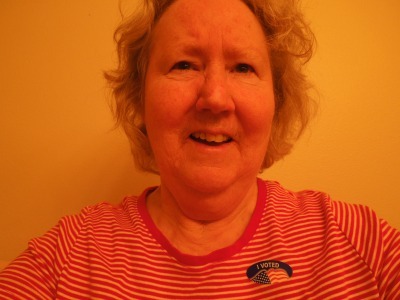 At our age, one just never knows if one will be able to go to the polling place on election day. I'm glad there's more than one way to vote. One can vote in person at the polling place, one can vote early at the County Clerk's Office, or one can vote absentee. Many of us choose to be permanent absentee voters because we're never sure whether we will be physically able to get to our polling place on election day. People can also vote early in the Clerk Recorder's Office if they cannot go to their polling place on election day. Permanent absentee voters can mail their ballots in, allowing enough time for them to be received by election day. Postmarks may not count. Two authoritative sources conflict. One can also return absentee ballots to any polling place on election day. I chose to take my completed ballot to the County Clerk's office. I have never forgotten the time my mother in Paso Robles mailed a letter to her sister in Long Beach and it took two months to get there. It somehow went by way of Washington, D. C..
For authoritative information, check the County Clerk's website. 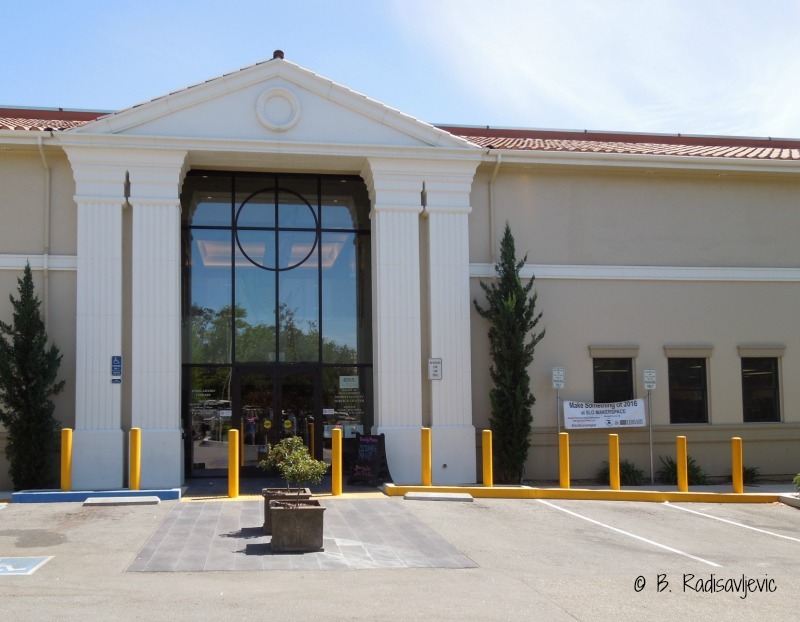 I returned my own ballot to the County Clerk's branch office in Atascadero. While there I saw people who were voting early. I took my ballot to the desk and asked the clerk to please check my envelope in case I'd made mistakes in the form of my signature. That's all there was to it. The hard part was finding the office. I didn't realize it was on the second story of the Atascadero Public Library building. It is. I have now done my civic duty. I read all the literature, sorted through all the propaganda on television commercials, and got recommendations from people who know the candidates better than I do. It wasn't hard making up my mind about local candidates, since I've seen them in action, know their records, and can see through what they say to what they've done in office previously. Some of the candidates I know personally. I believe voting entails more than making marks on a ballot. It takes a bit of research to vote intelligently. Sometimes it means getting involved in local politics, or at least attending a few city council or Board of Supervisor's meetings. If you've watched politicians in action after they are elected, you will be better able to judge whether they mean what they say when they want to be reelected. See Electioneering is in Full Swing in Paso Robles. PACs like to tell lies when it's too late for a candidate to refute them before the election. Do your research, talk to people you trust who keep informed about local races, and stick with what you've decided beforehand when the last minute mud is slung. If you really have no idea who is deserving of your vote, it's sometimes better to leave that one office or proposition blank rather than make an uninformed vote. It's far better though, to inform yourself. Cast your ballot, and you can get a sticker like mine. I'm better at voting than at taking selfies. Why Would Anyone Join the PG&E SmartRate Plan? Customers on the SmartRate Plan can save money on their electricity rates on most summer days from June to September. Smart Days may be called for 15 of those summer days -- usually the hottest ones. Customers are notified by phone, email or text the day before a Smart Day so they know to reduce their usage between 2 and 7. SmartRate customers will pay a surcharge of $0.60/kWh in addition to the regular rate between the restricted hours on Smart Days. For all other hours and on normal days, they will receive a credit of $0.024 per kilowatt hour. That's how SmartRate customers can save money if they can reduce usage during the hours more expensive rates are in effect. What is a Smart Day? For those of you who do not get your electricity from PG&E, a Smart Day is a day when a customer who is enrolled in the SmartRate Plan needs to drastically reduce energy use between the hours of 2 and 7 pm. Smart Days are called when very hot days are expected. Yesterday was a Smart Day for me. Tomorrow is another Smart Day. There can only be fifteen Smart Days per year per household, but on those fifteen days enrollees need to change their electricity usage patterns to save money. Is it Worth it to Enroll in the SmartRate Plan? The answer to that depends upon when you use electricity. My life is somewhat flexible. My husband is usually gone for the afternoon hours, and I usually stick around the house until I can't take the heat anymore and then leave for cooler places so I don't have to turn on the air conditioning. There is usually no reason why we need to be home using energy during those hours. I can save money on my electric bill with this plan. Whether you can depends upon your lifestyle. I cope with Smart Days in many different ways. The house usually stays cool enough to sit and read my Kindle with no lights on until very late in the afternoon. My Kindle Paperwhite 3G has its own light, and holds all the books I could want to read. It's compact enough to take anywhere I might want to go. I just make sure its completely charged the night before a Smart Day. I'm very sensitive to the heat, and I really need air conditioning when the temperature is in the triple digits. That's one reason many of PG&E's Smart Day Savers don't work for me, since many of them are outdoor activities like bike riding, sports, picnics in parks, or walking the dog. Some are more practical, such as going to the air-conditioned gym, eating out (which also eats up the Smart Day savings, as does going to a movie), or shopping, which I usually need to do anyway. On Smart Days I usually turn off every appliance except the refrigerator and freezer. I unplug many others. I turn off at least one of my desktop computers, and usually both. I unplug anything that's charging and turn the lights off. I do keep the forced air fan on to circulate the air so that it seems cooler than it is for as long as I stay home. It doesn't get too miserable to sit and read until very late in the afternoon. Yesterday I kept one computer on and used it until it got too hot for me inside . 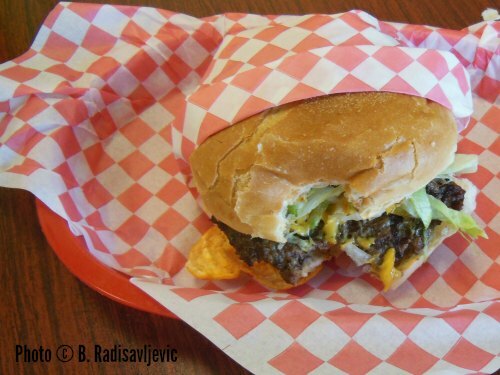 Then I packed my Kindle and its stand and took off for J's Burgers to fill my stomach. After I'd calmed my hunger pangs, I took off for the public library -- one of my favorite Smart Day retreats. It's cool, has comfortable chairs unless you sit too long, and has places to use your laptop if you need to. I read one of the books on my Kindle, The Only Witness by Pamela Beason almost all the way through before I left the library. It was not your typical mystery. One of the main characters is Neema, a female gorilla, who is learning American Sign Language as part of a university project. She is the only witness to the abduction of an infant. That's all I will tell you. I enjoyed the book, even though it's not the most realistic one I've read. Just right for a hot day, though. I kept reading after I returned home. I couldn't go to bed until I finished it. Tomorrow I will employ a different strategy. 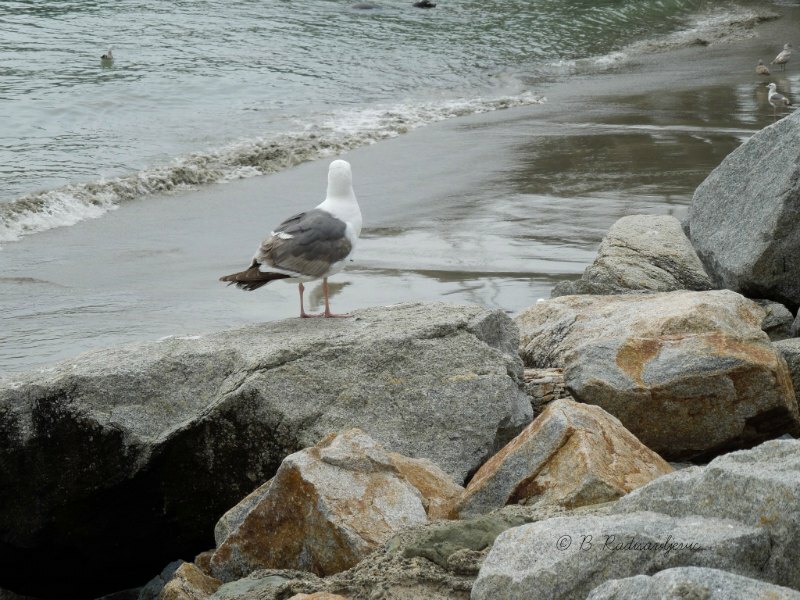 It will include taking my computer in for repairs, shopping at Costco and Trader Joe's and, if there's time and I have the energy, hitting one of the beaches to take some photos. I'm hoping if Hubby comes home early like he did yesterday before restrictions were lifted, he won't turn on the TV and a light again. Naturally, today, with no restrictions, he got home after seven. That's a man for you. By cutting electricity usage on very hot days, it helps prevent black-outs and brown-outs. Members of the program can save money if they adhere to the guidelines. Members only get notice of a Smart Day the day before, so planning ahead for entertaining at home can be difficult. If unanticipated events happen in your life on Smart Days that involve using a lot of electricity or not being able to cut your usage, you will pay much more for your electricity than you would otherwise during the hours the rates go up. Sometimes you may have to cancel your plans. Example. I wanted to spend yesterday and tomorrow blogging at home on my computer. I have had to change those plans and my posts will be delayed. Smart Days can be scheduled for weekends and holidays when you may not want to restrict usage if you have guests. Does your electricity supplier have a SmartRate plan or something similar? Have you enrolled in it? Why or why not? How would you spend your time if you had to reduce your electricity usage on hot afternoons? If you found this helpful, please share it. Sharing buttons are at the end of the post. The photo below was designed to pin on Pinterest. 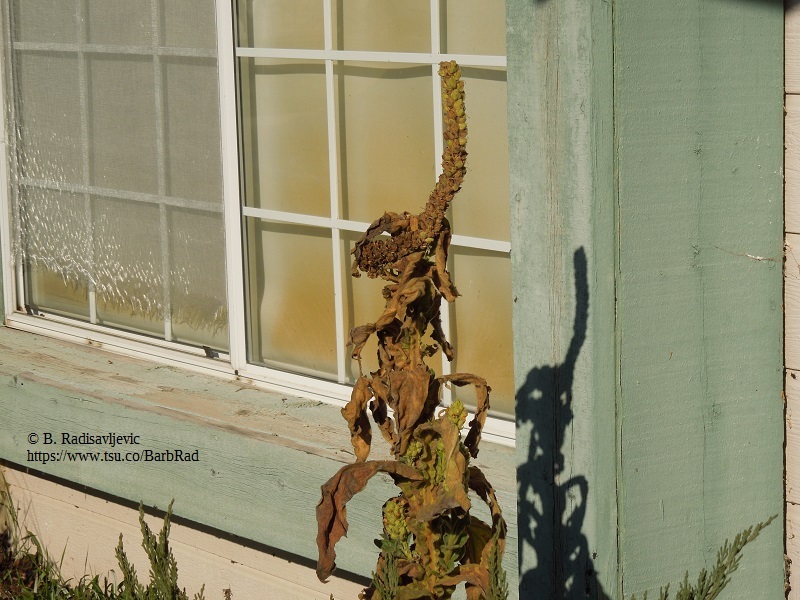 Five Reasons Why Air Conditioning Units Should Be Appreciated: Aire Serv Observes "Air Conditioning Appreciation Month"
This mullein plant, which is at the end of its season and reseeding in January, casts a shadow in the late afternoon sun which looks almost like the head of a hare. At least the mullein looks like a hare to me. Now that I take a closer look at the shadow, it might be a wounded ant. What do you think the shadow looks like? 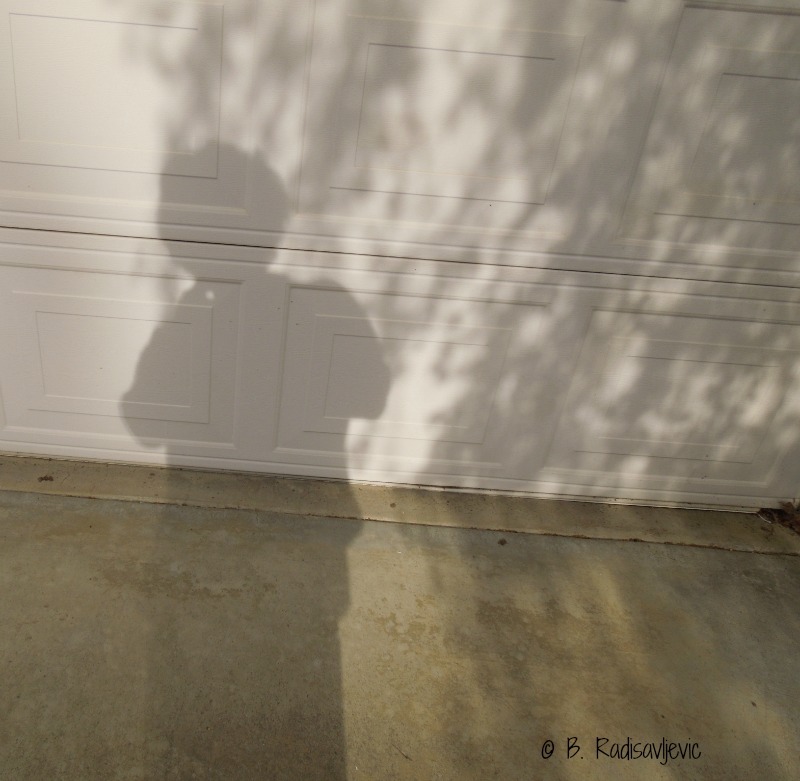 Below is my own shadow, under the shadow of a tree which is next to my driveway. All the shadows fall onto the garage door. City Daily Photo Bloggers all over the world post photos on the same theme on the first day of each month. 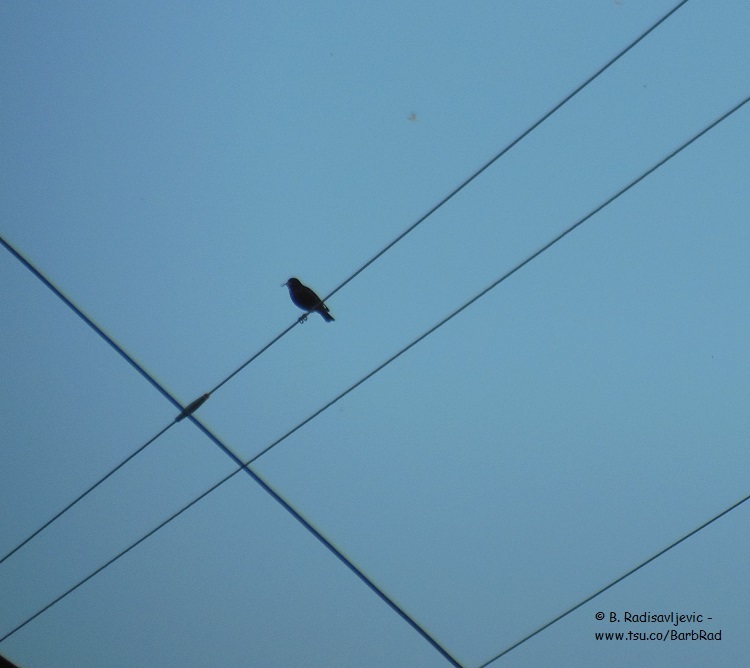 For June the theme is Shadows and Highlight. 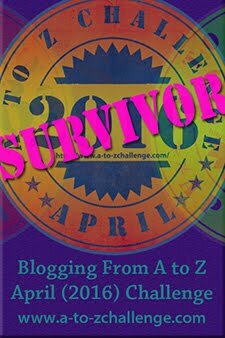 See how bloggers in other cities have treated this theme. 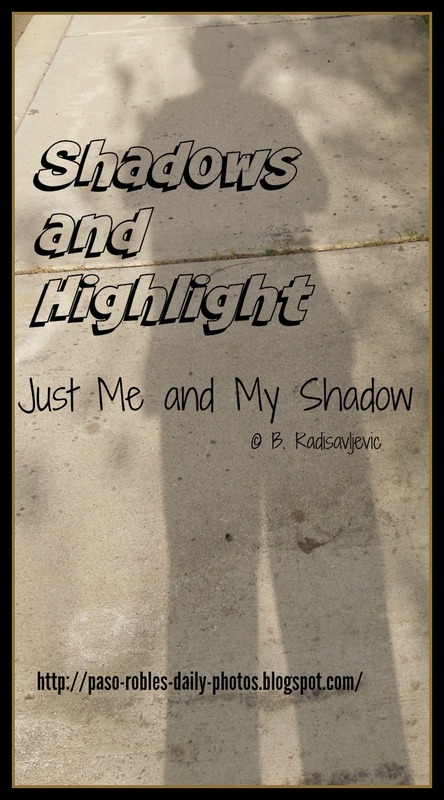 Here's just one more of my shadow, in case you want something to pin on Pinterest.